L: 81.5" x W: 58" x H: 69"
Jordan Full-Over-Full Bunk Bed If you're looking to outfit your kids' bedroom with gorgeous modern furniture, the Jordan full-over-full bunk bed is the right choice. The slatted headboards and footboards are simple and tasteful, making the aesthetic of this bunk bed truly timeless. If you're looking to outfit your kids' bedroom with gorgeous modern furniture, the Jordan full-over-full bunk bed is the right choice. The slatted headboards and footboards are simple and tasteful, making the aesthetic of this bunk bed truly timeless. L: 81.5" x W: 58" x H: 69" Weight: 206 lbs. Upper Bed Maximum Weight Capacity: 200 lbs. Lower Bed Maximum Weight Capacity: 200 lbs. I love that this is a full over bunk. Didn't think they had these until I went in looking around and I fell in love with it. I took my girls then to see it and they were in love with it also. I had purchased the chocolate color. My girls love it because not only is it a bunk bed they BOTH get full size beds and they also get to have more space in their bedroom. I was amazed with how sturdy the beds were. Definitely worth the price and the gentlemen that assembled the beds were fast and polite! I would recommend this product just keep in mind if your kid is taller for their age you might want to think about the height of the bed before you purchase it. My 11 yr old daughter is to tall for her age she love the bed but she said the bottom bed will be more comfortable to sit if the bed was a little higher. I bought this back in May for my two children. They love it and the built in ladder really saves time and space in a small room. So happy we picked it up! These by far are the hardest bunk beds to make up. I spend at least 30 minutes making up the top bunk alone! I know what you’re thinking..... “Wow!! Full size bunk beds! !” Yeah, that’s why I purchased them, but had I known I would be spending most of my Saturday mornings making them up, I would have never purchased them. And let’s not forget the fact that the ladder and side rails come loose. Thank God for the protection plan I purchased. This will be the second time in 2 years that I will be using it for this bed! Moms beware! 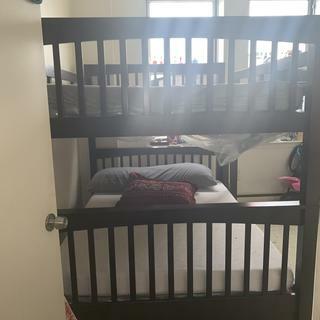 How thick of a mattress would be safe for the top bunk? The one in the picture does not deem to be safe looks like someone could just roll right off. BEST ANSWER: A mattress 9" high would be recommended for the top bunk bed. Do you guys do repair if the bunk bed ladder step break? BEST ANSWER: Hello Mariska! For assistance with repairs and replacements, please contact 866.383.4484, option 7. We would be happy to help you! My oldest son is almost 6ft tall. If he sleeps on the bottom bunk bed, will he hit his head every morning as he sits up? How much space is there between both beds? BEST ANSWER: From the platform where the bottom mattress sits to the bottom of the top bunk bed, the height measures 39". BEST ANSWER: Each of the Jordan Bunk Beds have a maximum weight capacity of 200 lbs. Can it turn in to two beds? BEST ANSWER: The Jordan Full-Over-Full Bunk Bed can be separated into two separate beds.